One of the hallmarks of action shooting is, well, the action part. Instead of standing still on a static range, you get to run around and shoot guns. If you’ve tried it for competition or as a more advanced defensive skill, you probably already know that it can be a little challenging to keep your feet moving and hit the targets at the same time. Fortunately, it’s not as hard as it seems the first few times you do it. With a few tips I’ll outline below and some practice, you can look like an expert blazing away at targets while you run. A common mistake when trying to shoot on the move is not moving. Seems like a bit of an obvious fail, but it’s completely understandable. After all, most of us learned how to shoot standing in a booth or on a line like normal people. It’s hard enough to keep track of all of the things you need to do to make a perfect shot without also moving your feet. What happens, then, is that many people interpret “shooting on the move” as taking a step, firing a shot, taking another step, and firing another step, all in a rather robotic manner. But that’s not really shooting and moving at the same time, is it? Another common mistake is to try to time shots to a certain position – shooting when both feet are on the ground, or when the right foot is lifted, or something similar. If that sounds awkward, that’s because it is. It takes a lot of thought to line that up with having an acceptable sight picture and trigger press at the right moment. So what’s better? Just move. Most of us learned how to walk as toddlers, and do a pretty okay job of it in everyday life. For that matter, if no shooting is involved, most anyone can jog or run a dozen yards across the range without tripping over their feet…at least, the vast majority of the time. We don’t normally need to worry about details like which foot goes first, or whether one foot crosses over the other. We don’t work especially hard to make sure we’re not bouncing around too much, especially if we’re holding something we want to be careful with, like a cup of coffee or our cell phones when we’re committing the sin of texting and walking. Simply said: when you’re trying to move and shoot, don’t overthink the moving part. Move at an appropriate speed and level of aggression to the terrain and the targets you’re engaging. Generally, that means move faster on more level ground and for closer, more wide-open targets, and a bit more carefully if you’re shooting harder targets in more difficult footing conditions. Easier, harder, faster, slower…all of that depends on your shooting ability. The best way to find out is to try different speeds both for the moving part and the shooting part. It’s important to hold your gun very firmly when shooting, in order to effectively manage recoil. It’s also important to hold your gun very firmly when shooting on the move, for two reasons. One is to help steady the sights. The other is to help control for the less than perfect trigger control that can occur as your feet are impacting the ground. The real question isn’t whether you should grip your gun hard; it’s how hard is hard? Fortunately, the answer is simple: harder. 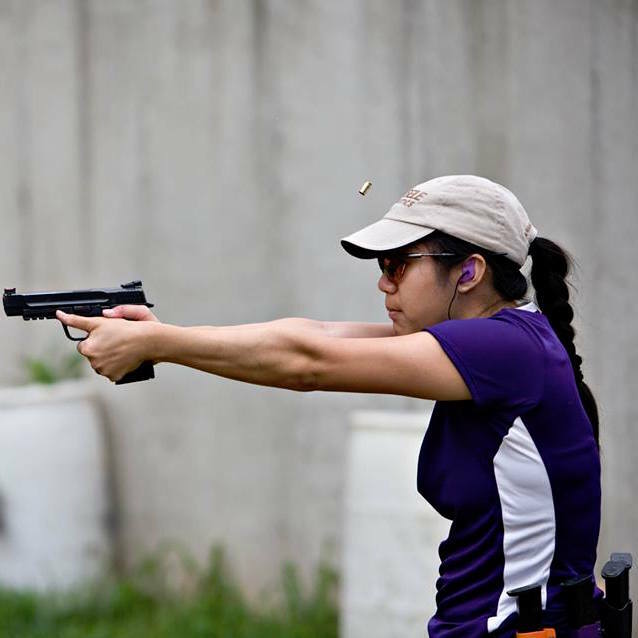 With pistols, you want to focus on squeezing your non-shooting hand more aggressively around the gun. 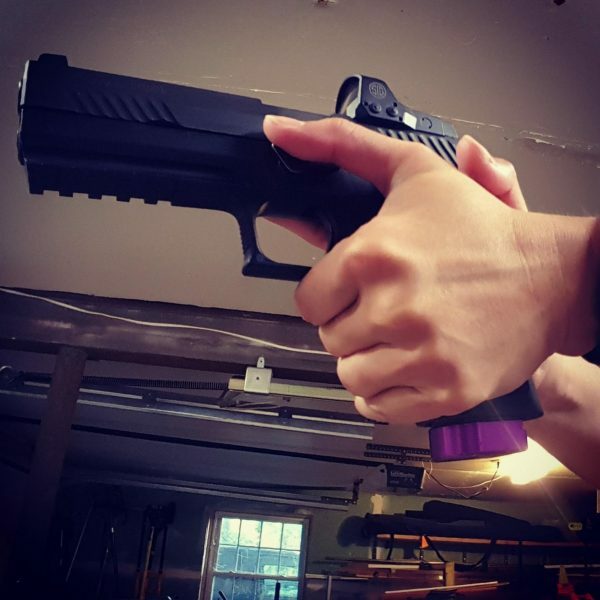 Keeping your non-shooting hand looser will help you keep your trigger finger moving by not having too much tension in that hand. Long guns – rifles and shotguns – should be treated similarly. Hold the gun up tight to your shoulder so that it moves with you instead of bouncing around unpredictably. You’ll find that if you allow your grip to loosen, your gun will start moving disproportionate to how much the rest of your body is moving. “Good enough” in the context of shooting while moving doesn’t mean being okay with hits outside the best-scoring area of your targets. There’s no necessary tradeoff here. It’s possible to move, quickly even, and still hit Alphas, Down Zeros, or whatever the penalty-free scoring is for your game or training of choice. What “good enough” does mean is that you need to be okay with a less-than-perfect sight picture for each shot that you fire. If you’ve worked on shooting at speed, you’ve probably already come across this concept. The standard rule of “equal height, equal light” with your sights aimed at precisely where you want the bullet to land doesn’t apply if you don’t need the bullet hole to end up at that exact spot. 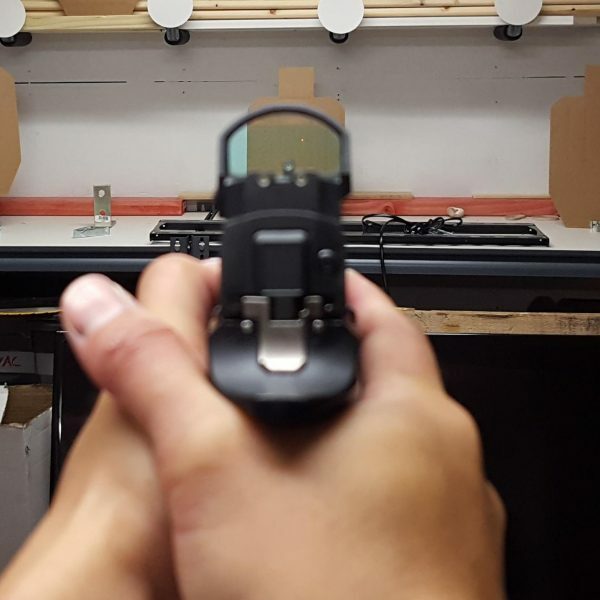 Slightly misaligned sights will still allow you to impact the target in the same general area that you’ve aimed, so long as your trigger control is good. The further away you are from the target, the more a small deviation in your sights will matter. Right up close, though? You don’t need much in the way of having that front sight perfectly lined up in the rear sight notch. The trick is figuring out how much imperfection you can accept and still get acceptable hits. Ultimately, the best way to learn this is to go to the range and intentionally shoot targets at various distances while experimenting with your sights. One of the ways to do this is sometimes called the “box” drill or the sight deviation drill. It requires a single target with a center aiming point, at whatever distance you want. Taking all the time that you need, fire one round at the aiming point. Then move just the front sight so that it is all the way left in the rear notch and fire one round. Repeat, moving the front sight all the way right. Then you’ll move the front sight all the way up so that the bottom of the front sight aligns with the top of the rear sights and fire a round, repeating with the top of the front sight aligned with the bottom of the rear sight notch. Take a look at the target when you’re done. You’ll probably be surprised by how many of the shots landed inside an area that would fit into the highest scoring zones on your targets. Keep that in mind as you think about moving and shooting at the same time. The amount of sight imperfection that’s acceptable while shooting on the move is a little bit less than when you’re standing still. That’s because your gun will be moving a bit more as you’re trying to shoot. By the time you have registered that the sights are within the realm of what would be acceptable if you aren’t moving, they may have already moved through and past what’s okay. In addition, trigger control tends to degrade somewhat when the shooter is trying to do more things at once. You can’t cure a completely jerked trigger with a better sight picture and strong grip, but having those things will help. When you’re shooting on the move, being willing to press the trigger with a “good enough” sight picture gives you more freedom and less stress. You don’t have to worry about the fact that it’s so difficult to get perfect sight alignment while you’re walking or running because it won’t be necessary. There are times when it’s perfectly okay to run, plant, and shoot instead of trying to shoot an array of targets while moving. Just because everyone else is doing it doesn’t mean it’s the right decision for you. If all of the targets are visible from one position and you are quick on your feet, it might make more sense for you to shoot them from that spot. 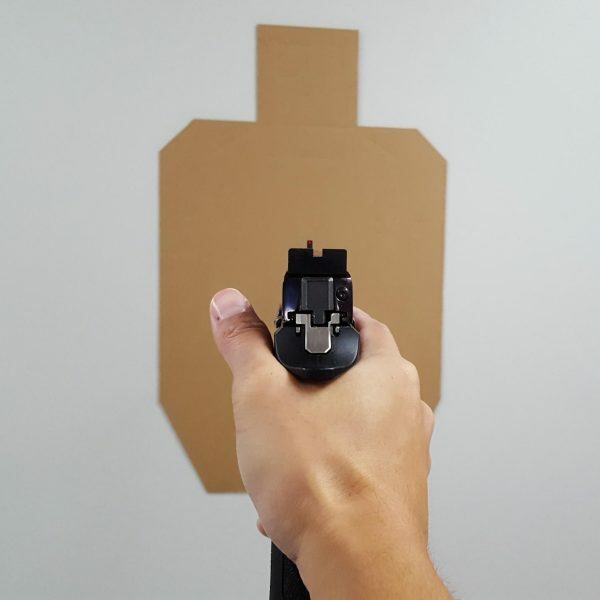 You can save some time by being aggressive about shooting the first target as you settle into that position, and start moving out of that position as you’re still shooting the last target. If the targets are difficult in some way, it might make more sense for you to not try to shoot them on the move. Racking up misses or low points can not only take more time, but also negatively affect your score. It might look cool to shoot a bank of poppers on the move – but only if you pull it off. You’ll need to be honest with yourself about your own shooting ability in order to figure out the best way for you to approach a shooting challenge. Just don’t forget that shooting on the move is an area where you will improve as you do more of it, so make sure you keep stretching your boundaries in practice. A certain amount of trial and error is normal and necessary to learn how to combine something you already know how to do instinctively (move) with something a little less natural (shooting). Any other tips you think we should add to help our readers to shoot better on the move? Hmmm …… the above comment makes perfect sense to me! The article’s author is simply stating the old ‘60/40’ (hand) gripping pressure rule in a slightly different way; AND, the statement is correct, too: With a two hand hold on the pistol it is a lot more difficult to shoot straight whenever the ‘strong hand’ grips the gun too tightly.